It will happen Monday night(August 7th) at the CA board room. It probably will start at 7:30PM. Tonight, Michael McCall, Kevin Day and others from Inner Arbor Trust gave a talk at Columbia Association. The Chrysalis will be ready on April 22, 2017. 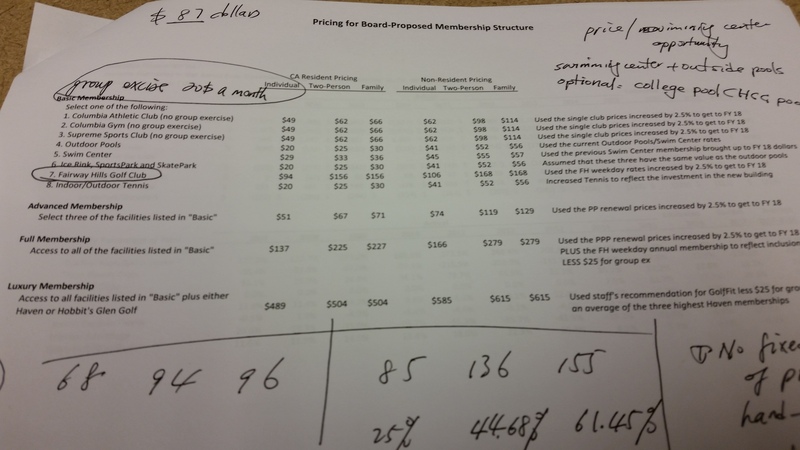 While CA is working on the new price and membership structure, I got a break-down price on each facility. Just keep it as a record and a reference. My latest article on Columbia Association’s Monthly magazine. River Hill is the newest of Columbia’s 10 villages, dating back to 1991. It had been around for nearly two decades by the time I moved here in 2010. Like those who were drawn to elsewhere in Columbia, there was much we found attractive about living in River Hill — the trails and pathways, the village center, the great schools and accessibility. 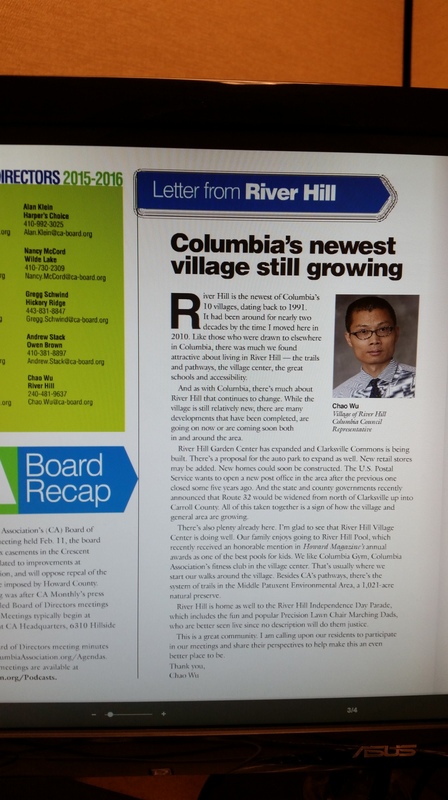 And as with Columbia, there’s much about River Hill that continues to change. While the village is still relatively new, there are many developments that have been completed, are going on now or are coming soon both in and around the area. River Hill Garden Center has expanded and Clarksville Commons is being built. There’s a proposal for the auto park to expand as well. New retail stores may be added. New homes could soon be constructed. The U.S. Postal Service wants to open a new post office in the area after the previous one closed some five years ago. And the state and county governments recently announced that Route 32 would be widened from north of Clarksville up into Carroll County. All of this taken together is a sign of how the village and general area are growing. There’s also plenty already here. I’m glad to see that River Hill Village Center is doing well. Our family enjoys going to River Hill Pool, which recently received an honorable mention in Howard Magazine’s annual awards as one of the best pools for kids. We like Columbia Gym, Columbia Association’s fitness club in the village center. That’s usually where we start our walks around the village. Besides CA’s pathways, there’s the system of trails in the Middle Patuxent Environmental Area, a 1,021-acre natural preserve. River Hill is home as well to a couple of annual events. This will be the fifth year of the River Hill Health Fair, which is hosted by the River Hill Community Association and Coalition Halting Obesity in Children Everywhere, or CHOICE, a nonprofit founded by River Hill High School students. And every 4th of July brings the River Hill Independence Day Parade, which includes the fun and popular Precision Lawn Chair Marching Dads, who are better seen live since no description will do them justice. This is a great community. I am calling upon our residents to participate in our meetings and share their perspectives to help make this an even better place to be. CA is currently thinking of revisiting the membership structure and how we can improve the customer service. 1) CA’s service is essential to our residents’ life such that we should keep our membership affordable. Our annual charge billed by CA covers 60% of CA’s expenses each year. 2) The current promotional membership structure is not desirable. Many residents may find the membership fee attractable when singing in. After two-year or three-year promotional period ends, the huge spike on the membership fee just make them unhappy. If we look at the first argument, we should just set a yearly rate, probably increase the rate a little it annually. a) What is the expected percentage that CA residents will become CA members? We want an affordable rate for our residents. Right now, we have 20.62% participation rate, i.e., out of 97,000 residents, 20,000 join CA membership annually. It has been close 20% for several years. If we consider families/households rather than individuals, the ratio is much higher. It is around 38.4%. b) For non-CA residents, what is the proper rate? Right now, non-resident's membership price is 25% over that of the resident. We also want our neighbors to use our facility. I got another reader’s response and would like to share two pictures related to Symphony Woods. This will be a place for record in the future for Symphony Woods when we could not get a full picture of this project or lose track of this. Previous post from Andy Stack is a good reference. This is another reference for the two designs for this vision. The original one was abandoned and a new design (current one) was proposed. Total insured values of CA assets are $102,406,000 (more than 100 million dollars). I am listing all facilities with insured values more than 1 million dollars. Note: This article was written by Andy Stack, Chairperson of CA’s Planning and Strategy Committee. It is a very good introduction to the Inner Arbor Trust and CA’s involvement. I really appreciate his effort sharing this article with us. The CA Board has changed quite a bit over the years and Gregg and I are the only ones who have been with the process since the very beginning until now. Here is my unique perspective on the whole situation from the beginning as I was involved in all parts of it. Several years ago, after the County approved the zoning changes to guide the development of Downtown Columbia, CA started planning for the development of Symphony Woods. The CA Board was concerned that Symphony Woods was (and still is) little used and needed some environmental restoration. There were no amenities to draw people to Symphony Woods. The CA Board wanted to change that and develop Symphony Woods under the guidance provided by the new Downtown Columbia redevelopment process. This was the first time CA was using the new guidance and process. (In fact, CA was the first entity to do so.) The first part of the process requires the submission of a Final Development Plan (FDP). The second part involves submission of a Site Development Plan (SDP). Note that Symphony Woods together with Merriweather Post Pavilion was designated by the County as the Merriweather-Symphony Woods Neighborhood in Downtown Columbia. The FDP that CA submitted was in essence a concept plan. It was reviewed by the County Department of Planning and Zoning (DPZ), the Design Advisory Panel, and finally the Planning Board. Although the Planning Board did approve the FDP, it was clear that the County was disappointed that CA had not presented a plan for the entire neighborhood reflecting a shared vision and design for Merriweather-Symphony Woods as a unique cultural and community amenity. In further discussions, the County indicated that CA was not meeting the thrust of the Downtown Columbia redevelopment guidelines, and it became clear that we were not going to succeed if we did not address the County’s concerns. CA should incorporate art within the park. At that point the CA Board began considering how to revise the plan to meet the County’s concerns, and we voted (publicly) to pause further work until we could address those concerns. We really weren’t quite sure how to proceed. At the same time, we began to realize that developing Symphony Woods was going to be an expensive, complex, time consuming process. Given all the other things that CA was doing and that needed to be addressed, the CA Board wasn’t sure that developing Symphony Woods was the best use of CA resources. We did not want to get into the development business. Enter Michael McCall. Our former CA President learned that Mr. McCall was working with HHC and had developed a concept plan related to Symphony Woods. 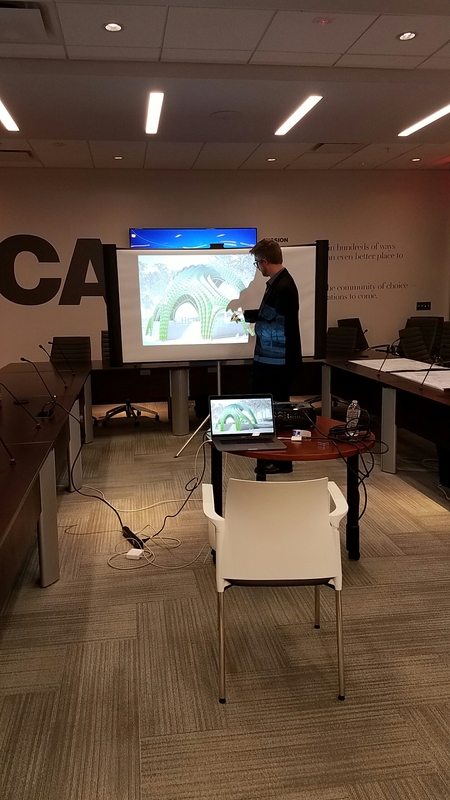 At the CA Board’s invitation, Mr. McCall presented the plan, which included Symphony Woods, Merriweather Post Pavilion, and the surrounding Downtown Columbia neighborhoods. What was clear, from the very beginning, was that the McCall plan showed a vision for the entire neighborhood that was in keeping with the Downtown Columbia redevelopment guidelines and incorporated HHC’s plans. These were key features that CA’s FDP lacked. It is important to note that the McCall plan was strictly Mr. McCall’s, not CA’s, and therefore only he could share it. At that point, the CA Board wasn’t even sure that this was the direction in which we wanted to head. Merriweather Post Pavilion is the heart of Symphony Woods. One of its unique features is its setting in the center of the Woods. The Downtown Columbia Plan clearly understood the importance of the Woods to The Pavilion, envisioning them as an integrated whole, and created a special neighborhood containing just Symphony Woods and Merriweather Post Pavilion. That Neighborhood is intended to be a vibrant cultural district, comprising a natural wooded landscape for the arts and compatible commercial uses that people will want to visit over and over again. In October 2012, the CA Board held a public work session to discuss the way forward with Symphony Woods. Although the session was part of a regularly scheduled CA Board meeting and was advertised, no residents attended. The Board discussed how to address development, funding, and ways to meet the County’s concerns. The Board did not want CA to have to pay for all the improvements to Symphony Woods and did not want to devote staff time and CA resources to developing Symphony Woods over a 20-year period. It seemed too much to place on staff and would detract from other pressing CA needs. The CA Board finally settled on a way forward. It authorized the CA President to work with Mr. McCall to revise our plan for Symphony Woods and create a separate entity to oversee development and funding. The result was what we call Inner Arbor. One of the challenges in revising our original plan was determining what additional features could be incorporated to meet the goal of allowing year-round use and make Merriweather Post Pavilion and Symphony Woods an integrated, unique cultural and community amenity. Merriweather Post Pavilion’s strength lies in hosting concerts. What would complement that while allowing for year-round use? One idea for Columbia that Jim Rouse had but was not able to implement was the creation of a setting like Tivoli Gardens, which has theaters/areas for performance. Drawing on that concept, it was thought that an Arts Village focused on performance would complement Merriweather Post Pavilion and enable year-round activities. Additional possibilities were a great children’s play area and active art. Additional festivals, like Wine-in-the Woods, which could make use of Merriweather Post Pavilion, would be another way for Symphony Woods to provide a unique amenity for the community (although, of course, provisions would have to be made to minimize the damage that festivals could cause to the woods). What the CA Board liked about the McCall plan, which came to be called the Inner Arbor plan, was that it was a revision of our initial plan – it kept all the amenities from the FDP (which residents liked), simply relocating some of them, added new amenities, reduced the number of trees to be cut, addressed the entire Symphony Woods, not just the northern part, seemed to meet all the County’s concerns, and fit into HHC’s plans for Merriweather Post Pavilion. As a result, the CA Board approved (by an 8-2 vote) the Inner Arbor Plan at a Board meeting on February 14, 2013. The Inner Arbor plan is a concept plan for the entire Symphony Woods and integrates Merriweather Post Pavilion into the plan. It envisions Symphony Woods as a vibrant place that will attract people year-round. Both active and passive uses will exist. An Arts Village was added in the eastern portion of the park; the buildings are located on already disturbed land and existing parking lot. This minimizes utility work and environmental disturbance. The Arts Village provides opportunities for year-round use and additional cultural and community activities. The fountain was moved to the Arts Village area to minimize utility work and maintenance concerns. Art was added in different parts of the park. A sculpture garden was placed in the southern portion of the park. Pathways meander among the trees and circle the park. Entrances to Merriweather Post Pavilion (east, west, south) align with plans for Merriweather Post Pavilion [Note: Merriweather Post Pavilion will not have a north entrance]. Additional trees will be planted to enhance the woods. Care will be taken during design to allow festivals to occur (and also use Merriweather Post Pavilion) while minimizing damage to the environment. Our belief that the Inner Arbor plan would meet County concerns was proved true. 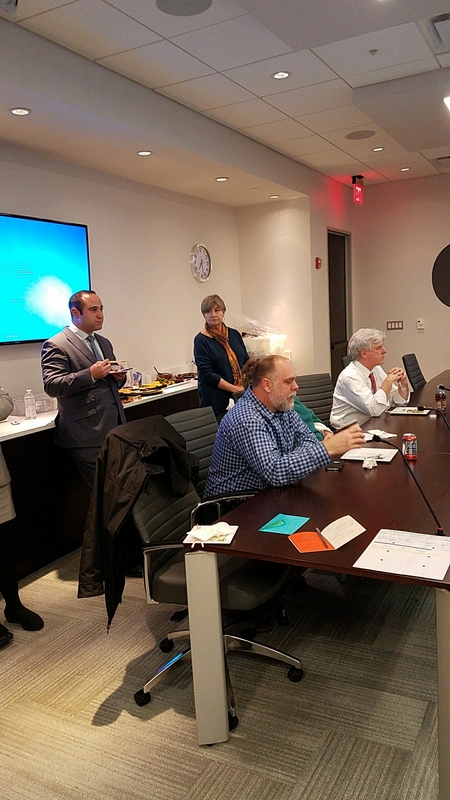 County officials were pleased with the plan – both County Executives (past and present) stated their support, as did the County Council and DPZ officials. The real validation came when DPZ and the Planning Board agreed that the Inner Arbor plan was just a revision of the approved FDP (remember that the location of the amenities in the FDP was not stated) and we could proceed to the SDP phase of the process. This is significant because otherwise we would have had to start all over again with the submission of a new FDP. The County also evidenced its support of the plan by providing millions of dollars in funding to Inner Arbor. 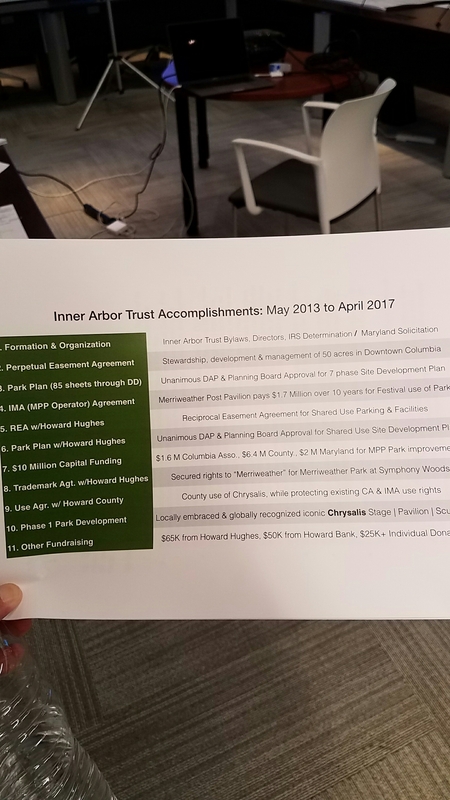 In April 2013, the CA Board approved the creation of the Inner Arbor Trust to oversee the development of Symphony Woods and to raise funds for this development. This removed the burden from CA staff, created an organization solely focused on Symphony Woods, and allowed for funding from non-CA sources. The CA Board thereafter approved an easement agreement with Inner Arbor Trust granting them certain development rights in Symphony Woods. In July 2014, in accordance with the easement agreement, the CA Board endorsed the Inner Arbor plans for the northern portion of Symphony Woods. In November 2014, the Planning Board approved the first SDP for Symphony Woods. Incorporates active and passive uses (in particular, allows festivals to occur while minimizing damage to the environment). You may be interested in some background regarding the creation of Inner Arbor Trust. The CA Board had been discussing joint ventures with other organizations (both public and private) as a way to share costs. However, joint ventures proved to be difficult to create and it was not clear that there were any organizations interested in joint ventures with CA. Now CA did know how to create non-profit organizations. In fact the CA Board had recently authorized the creation of a new nonprofit organization to handle Columbia’s 50th Birthday celebration. The CA Board intended that this new organization qualify as a 501(c)(3) organization so that it could accept contributions that would qualify as tax-deductible charitable donations and therefore make fundraising easier. At the CA President’s recommendation and after careful deliberation, the CA Board authorized the CA President to form a new nonprofit organization to be called Inner Arbor Trust. The CA Board clearly understood that this was to be an independent organization, not a subsidiary of CA. It was how we created the 50th Birthday corporation. The CA Board was also aware that if we wanted Inner Arbor Trust to be able to get donations from businesses, individuals and other organizations, it would have to be a 501(c)(3) organization for tax purposes. The same process occurred with the 50th Birthday organization. In order to give Inner Arbor Trust the flexibility needed, minimal controls were imposed. The CA Board understood that Inner Arbor Trust was (and was meant to be) independent of CA. The CA Board was also aware that an easement would be required and this was a better vehicle for providing any needed controls. The Inner Arbor Trust was incorporated with a five member board of directors: the CA President, 2 CA Board members, and 2 non-CA persons. Inner Arbor Trust was to be the developer for Symphony Woods and was to raise money to build, operate, and maintain Symphony Woods and any amenities constructed. In order to achieve 501(c)(3) status, Inner Arbor Trust needed to show that it was not controlled by CA. Their board decided to add two non-Columbia persons to the Board. This would give CA 3 spots on the Inner Arbor Trust Board, but not control of a seven member board. This was done with the support of all the CA people on the Inner Arbor Trust Board. This change helped Inner Arbor Trust receive 501(c)(3) status very quickly. A similar thing was done for the 50th Birthday organization. Non-CA people were added to its board to ensure CA did not have control. The 50th Birthday organization also achieved 501(c)(3) status. Once Inner Arbor Trust was firmly established, CA and the Inner Arbor Trust began negotiations on an easement. After careful deliberations and review (and some changes made by the CA Board), the CA Board did approve the easement with Inner Arbor Trust. CA did add some controls in the easement. 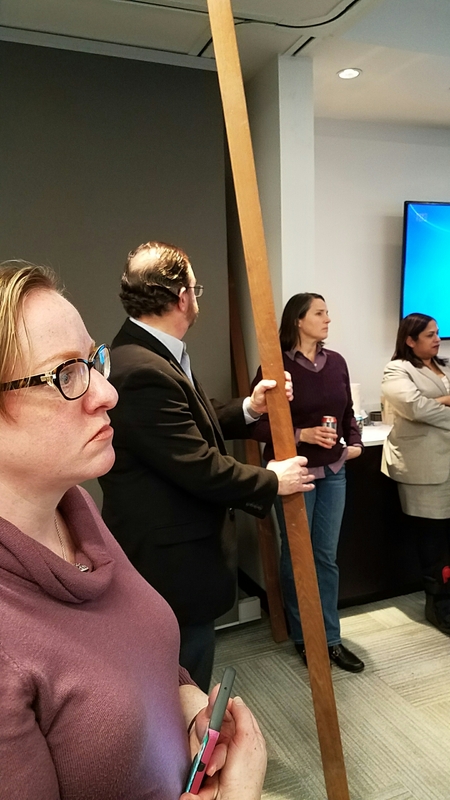 Because Inner Arbor Trust had to follow the County Downtown Columbia redevelopment process, the CA Board knew that our residents would have ample opportunity to express their opinions during the process. There are multiple steps in the process where community input can (and is) gathered and considered and these occur over months. The CA Board did not believe additional meetings, beyond those required by the process, were needed. We wanted to make sure the people of Columbia could be heard, but did not want to overburden the process. Sometimes, too many meetings lead to fatigue and are counterproductive. In the easement agreement (which is public and filed in the land records of Howard County) approved by the CA Board, Paragraph 5 (a) (iii) states that CA will cooperate with Inner Arbor Trust in the execution and delivery of applications, filings, requests and other documents related to required governmental approvals and generally cooperate as reasonably requested by Inner Arbor Trust in connection with development activities. The Board is bound by the terms of this contract just like it is bound to any other contract authorized/signed by CA. This obligates the CA Board to support Inner Arbor Trust in its work and development activities. The easement is a legally binding contract and we need to act accordingly. We do not want Board conduct to cause a breach of contract. You may want to read the easement agreement as it spells out duties and responsibilities of both parties (CA and Inner Arbor Trust). 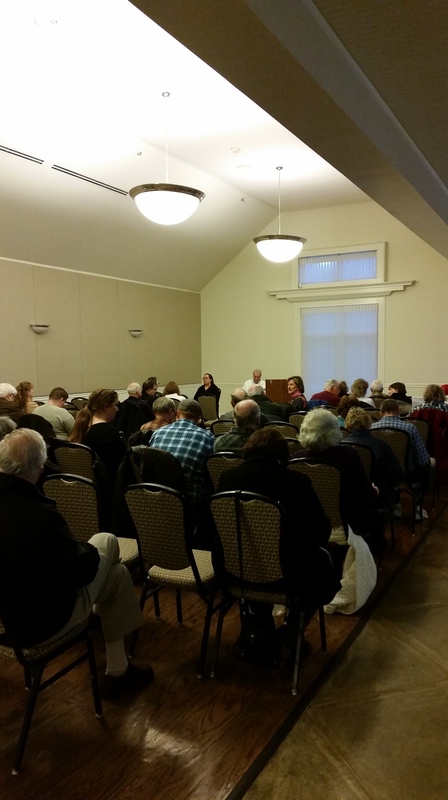 In dealing with Symphony Woods, the CA Board had difficult decisions to make. But after careful deliberations, the CA board did make the decisions. In all our deliberations, the CA Board was careful to consider what would be best for the people of Columbia, both those currently living here and those who would live here in the future as Symphony Woods was developed over 20 years. I always want to keep our residents informed such that we make intelligence decisions. For people who attended or listened or checked CA’s BOD meeting on September 10, 2015 , an updated membership study was proposed. This is our continued effort to improve our customer service and satisfy the needs of our residents. The number of membership type will be smaller, some membership types will have more programs available and most membership price will be raised ( a lot! ). The board and staff have not approved the new membership structure yet. If you want to have a look at it, please check at CA website for the meeting package under Sept 10. Or you can email me and I will send you a copy. Our Planning and Strategy Committee will have two meetings discussing the 2017-2019 budget. One is on Oct. 8 and the other is on Oct. 22. You are welcome to attend them or send me and the board your suggestions. I know very few actually pay attention to the meetings. However, meeting outcome will affect you. It is better to give us feedback earlier than to complain later. Poll: How do you feel Columbia Association annual charge rate? Just open a poll after discussion with a resident, how do you feel Columbia Association annual charge rate?